In addition to being steeped in history, Valley Forge is also one of the most beautiful parks in the Philadelphia region. And when fall foliage is in full color, that beauty is even greater. All of the park's 3,500 acres are beautiful, but some areas stand out above the rest. We've picked out eight of the best places in the park to view the fall foliage, areas that offer historical or scenic backdrops that set them apart from the rest. 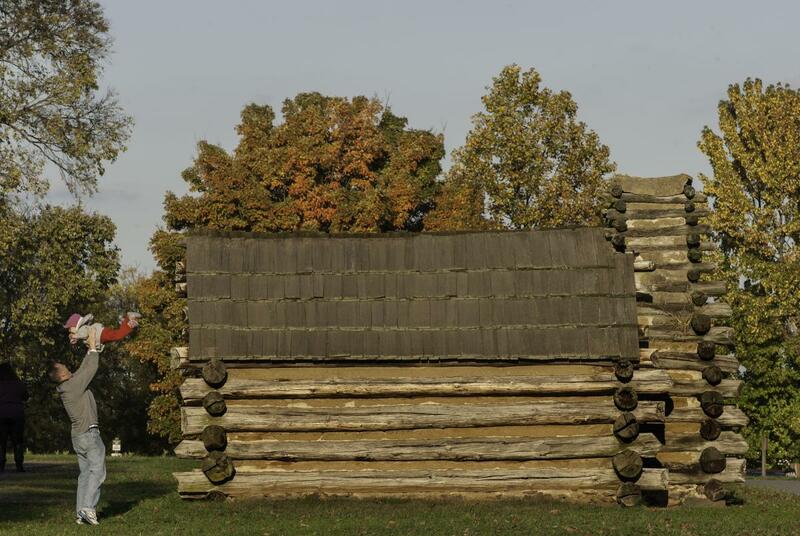 The Muhlenberg Brigade Huts are a series of reconstructed log cabins that show how the Continental Army lived during the Valley Forge encampment of 1777-78. It is also one of the most scenic stops in the park, with sweeping vistas of the woods in the valley below. 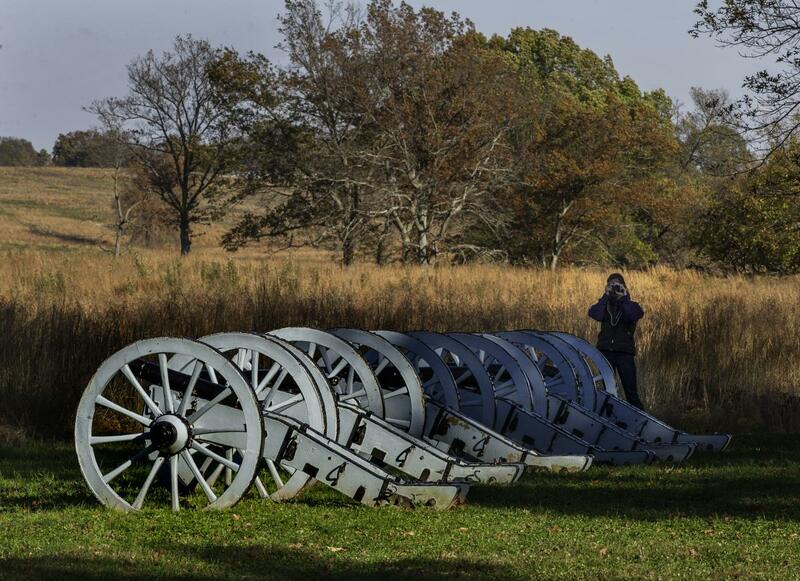 Rows of cannons line artillery park, the site where Henry Knox and his artillery unit trained during the winter encampment.The area is one of the most picturesque in the park, a great photo opportunity year-round, but especially with the fall foliage as a backdrop. 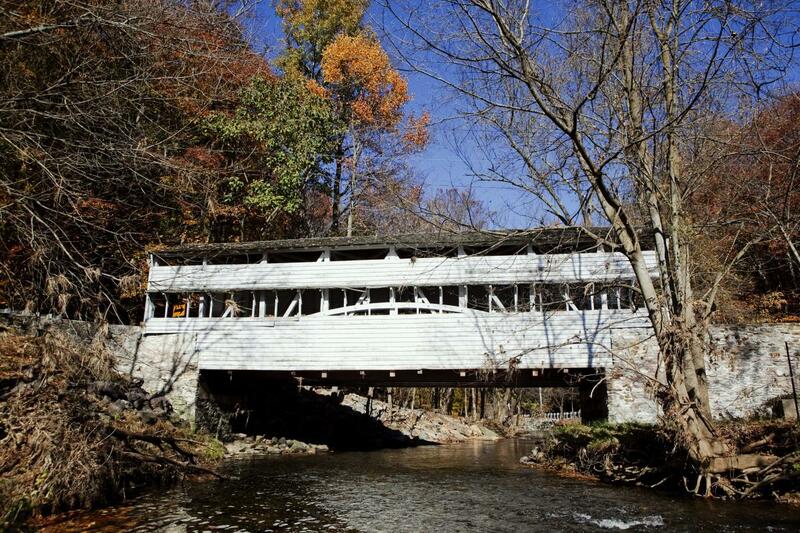 A highlight for many visitors to the park is the historic Knox Covered Bridge, which has spanned Valley Creek for more than 150 years. Autumn colors stand in contrast to the white-painted bridge, making it a site to behold in fall. 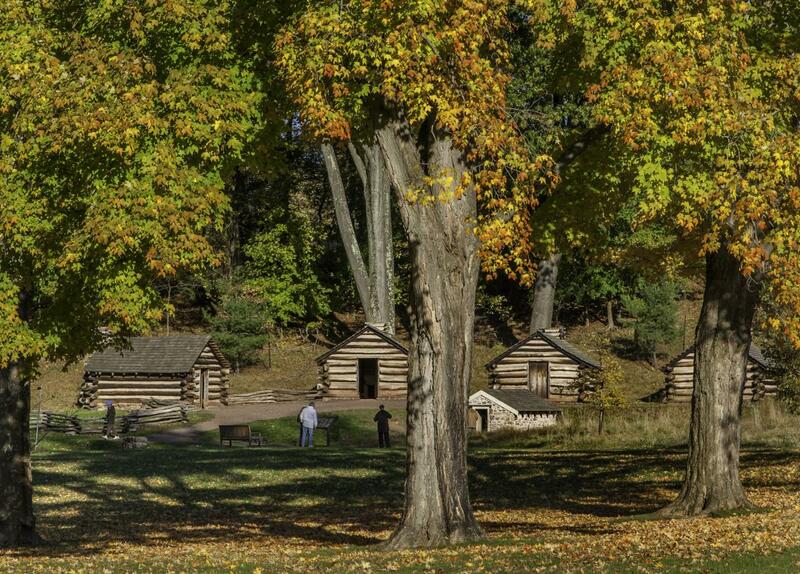 The area surrounding Washington's Headquarters, including the Guard Huts (pictured) and the former Valley Forge Train Station are set among a grove of trees that show off brilliant colors during the fall. Washington's Headquarters and the Train Station - now serving as a museum of Washington's leadership - are open daily from 9 a.m. to 5 p.m. during the fall. Mount Joy and Mount Misery tower over the western reaches of the park. Seen from below, the mountains are stunning, but for those willing to hike to the top, the peaks offer unmatched views of Valley Forge. 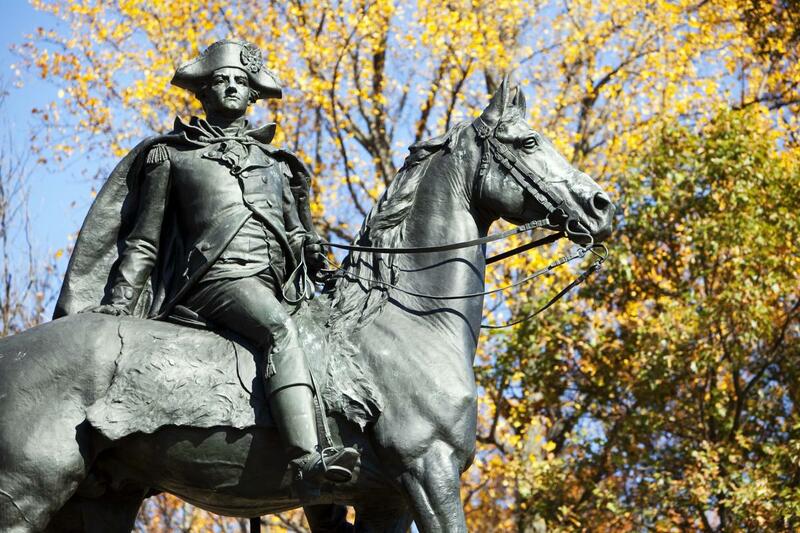 The Anthony Wayne Statue is an iconic symbol at Valley Forge Park. The statue looks out toward Waynesborough, the General's familial home in Chester County. The Wayne's Woods picnic area is just below the statue and is a great place to enjoy lunch with a scenic view. Located on the north side of the Schuylkill River, the Betzwood area of the park is an area that is definitely worth a visit in the fall. 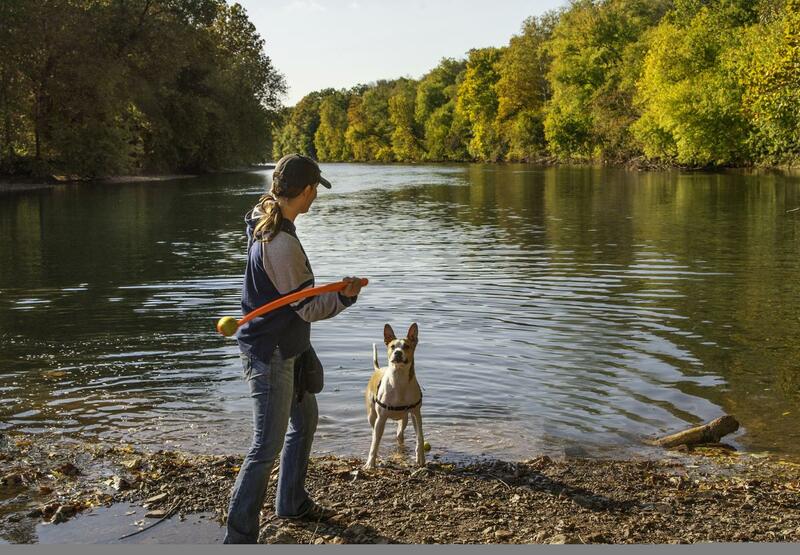 The area includes two trails - the Schuylkill River Trail and the park's River Trail. Both offer fantastic foliage. The waterside picnic area is also an idyllic spot for a family meal. 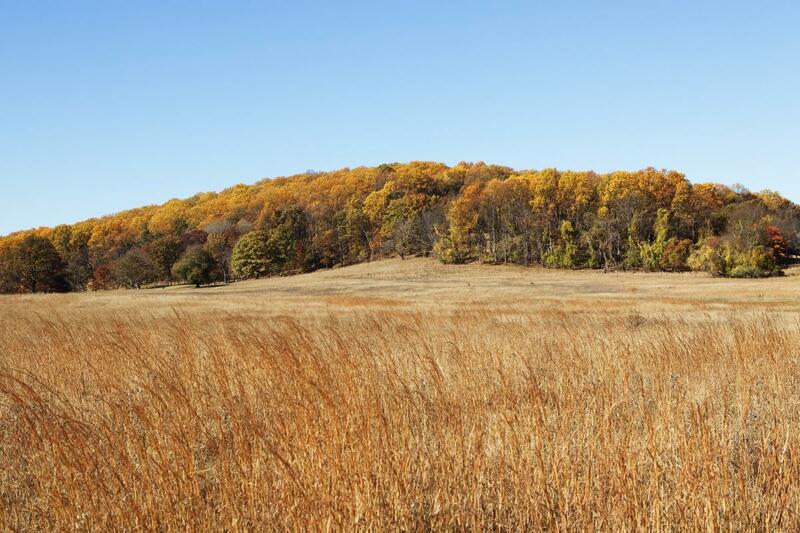 Also on the north side of the river, Pawling Farm is an underappreciated area of the park. 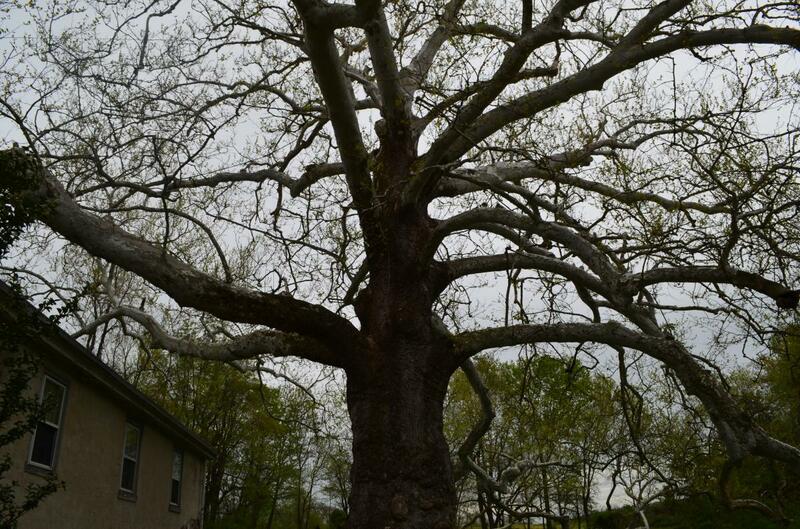 The farm was in use before and after the encampment, and the land is home to the Pawling Sycamore (pictured), a likely witness tree to the Revolution that is believed to be more than 250 years old. This area of the park also features tree-lined walking trails and the remains of the historic farmhouse, barn and other buildings.